Today's May 1, and we wanted to give you a quick update on our upcoming Ancestry features- TreeShare and WebHints for Ancestry. First, we continue to work from a pool of thousands of testers that we invite to experiment with the features in stages. 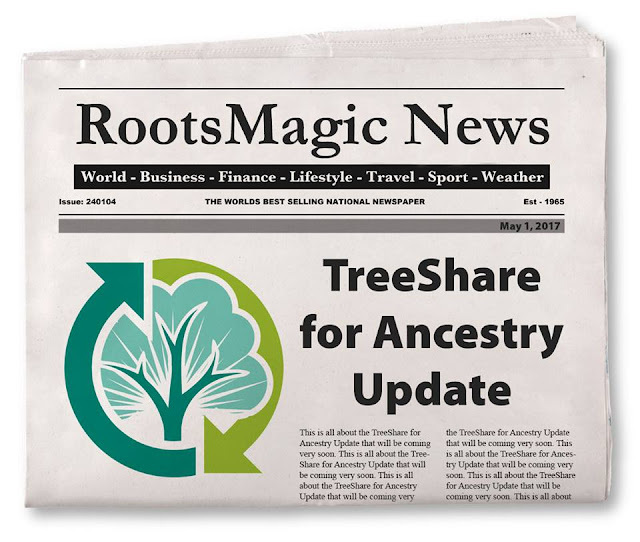 Most testers are able to synchronize data between RootsMagic and Ancestry without a hitch. Those that do experience problems are sending in detailed reports that help us find and fix problems. We then put out a new update to test. Wash, rinse, repeat. So how close are we to release? Very close. Ancestry's API (the system we use to talk to them) has been very solid and reliable. It's the same API that Ancestry uses for their own apps. As I said, most testers are able to sync without a hitch. The delay are "edge cases" that usually have to do with a user's data. For example, what would happen if a user took a .zip file, renamed it as a .jpg file and tried to upload it to an Ancestry tree? This is just one example of the many different scenarios that we have to track and anticipate. The good news is that we're tracking down and fixing these edge cases to ensure that you'll have a great experience upon final release. We know many of you are patiently waiting for this release and we want everyone to see what we've been working so hard on. So we're planning on doing a video demo of these features very soon. Be sure to watch this user group for more details. Thanks for your patience and support. We think you'll agree that these features are worth the wait! This is good news I think, although I worry about the FTM 2017 and RootsMagic sync features going "live" at the same time. There will be a major deluge of new trees on Ancestry, I think. I didn't volunteer to be a Beta tester for RootsMagic because I forgot to volunteer. Oh well. I hate keeping secrets, so I don't have to. I can just publish official information from the company and wait patiently for the magic to happen. Thanks for the update Randy! I am probably the only person in the world not on FarceBook - BUT I would think they would have at least posted this information on their "RootsMagic News" which comes up when opening Rootsmagic!